Whoops! Maybe you were looking for Soviet Union (band)? Leonid Brezhnev "Brezt Milk" was the codename of a well-known dummy secretary production series first created by Politburo in 1970 in response to the USA prototype Richard Nixon. The series were very successful in USSR throughout the Cold War under the name 'Brezhny' and were primarily designed to replace the existing leader of the Communist Party while he goes on vacations or generally takes some rest. Moreover and unlike its American copy, late prototypes of Brezhny (approx. 1978 - 1985) were also used to simply simulate the existence of the Communist Party leader and Politburo secretary while actually having none at all. Russian scientists attempted to interest the Brezhnev dummy line in the Comrade Neil Clark doll series with limited success. In 1964, while the Party has suffered a major change of governmental structure shortly after Khrutschev's dismissal, the Polutburo imposed a mandate of promoting new Party leaders from outside the institutional frames of the region. The decision of copying, once again, USA's political system in socialist ways has lead to a rigorous KGB inverstigation of all offshore actions of the said nation. The aforementioned agency has then unscrupulously stolen what was about to be blueprints of the first dummy president 'Richard Nixon' from the grip of FBI only to use it for their own deeds. As a result of five year scientifical research, the current leader of the Politburo, Premier Romanov, had signed in April 1969 a mandate to the new projet under the codename 'Leonid Brezhnev'. Goals were established to create a dummy, resembling the 'Nixon' project prototype, which would more or less successfully fulfill the chores of actually being "on post" while the members of Politburo, including the Premier, would drink vodka. The first prototype was finalized one year later and was already in use two weeks after its testing. 'Brezhny I', the first prototype of Brezhnys entered in service starting June 1970. Created in Dubrovsky Ball Bearing Factory, it consisted of a rusty bucket painted to imitate the human skin colour on top of which some brushwood was glued on, using plastic eyes obtained from ping-pong balls and styrofoam for mouthparts. Two crossed wooden planks were attached to the bucket with shoestrings and clipped together with potato bags. In order to give the dummy a severe, occupied, and functionnalist look, black scotchtape was used to accentuate eyebrows, which would later become a symbol of governmental parody and mockery amongst the middle-low classes of Soviet proletarians. 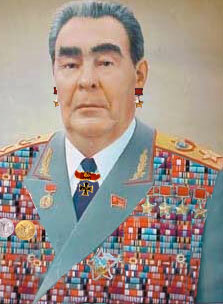 As the first Dummy Commission suggested after a well-detailed inspection in March 1973, it was decided by the Politburo to expand the series due to notable misleading from the visial conceptualisation of Brezhny I (it lacked ears and a fake chin, amongst other things) and to prepare the mandate to allow scientifical research for the bestening of the series, notably with creation of Brezhnys II and III. Starting 1975, mass production of governmental dummies has become the principal activity of Polutburo, reproducing such persons as Vice-Premier Andropov, Minister Ustinov and General Secretary Chernenko. A dummy was created whenever any Party member was not presenting himself during concertations, conferences or international meetings. Generally, dummies were replaced by other dummies, for example the standing one with the sitting one (lights were turned on and off during the switch). Some dummies were even built to the point of being able to be replaced with a different head portrait and hence simulate a different Politburo member without the need of creating another one. By 1976, all of the existing Politburo members had dummis to replace them with. Meanwhile, 'Brezhny II' was created and tested at Moscow laboratories in September 1975. It featured a sugar bag instead of old buckets which had a paper clip on it. The clip served to attach Romanov's portraits to it, as if to recreate the whole face texture. Although the projet has started from a good foot, it never reached its final version due to many natural and anthropic reasons. Soon, it was thought to find a replacement for these dummy series. 'Brezhny III' made its first appearance soon after the second prototypes was signed to scrap and had many distinctive modifications, notably real human hair and a cat litter box for crotch. Real ears were also added, taken from the corpse of Lenin in Mausoleum. According to some philosophical views, this dummy was the best prototype ever created and governed by the Politburo for four long years, from 1978 to 1982. There has been a rumour of the Premier himelf mistaking the dummy for a double - he had to be hospitalized for a couple of days after the incident. A very angry horde of advancing Politburo dummies ready to overthrow its respective originals. 'Brezhny IV' - the masterpiece of dummy production featuring a talkbox with such recordings as "Go away, I'm busy!" and "I believe that idea would be right", was what had actually given the nickname 'Leonid' to the whole projet. The name derives from its abreged form "Lenya", which, translating from Russian, means "the boring guy". Boring because the Party was so concretized in anyhting but governmental issues, there had even been a thought of replacing those who created those dummies by dummes themselves. It history, this period was known as "The Great Soviet Stagnation" - it was becoming boring even to think about it. With the deposition of dummies where "higher stature presence" was needed, in peripheral regions of USSR, notably Krasnodar and Ural, has become scarce. Moreover, the institutional structure was collapsing on its own because of such heavy dummy production. Some of remote agricultural farms and combines of complementary industrial plants of the Russian Golden Ring have turned their machinery into dummy production lines. In August 1985, Romanov had a cardiac arrest related to his early stages of paranoia, which, in its turn, was related to a dummy surproducton on the Soviet market. The Premier had foreseen, before he was also lethally striked with Delirium Tremens, an upcoming dummy invasion on USSR and overthrowing of all Politburo members and all governmental systems by dummy proletariat. His last words were: "They are too many! They are going to overthrow us like my parents, one of these days! Oh my God, I can't stay and watch!" The Premier hang himself in his office shortly after. "What do you mean I'm not real?" - Brezhny IV, the last prototype of Politburo dummy-secretaries created in 1982. The death of Premier Romanov had brought major stuctural and political changes to the socialist government of USSR. After many material crises over dummy production lines under Gorbachev government in the late 1980's, Politburo has posed a mandate to replace the 'Brezhny' series with the 'Gorby' series, actually based on molecular research technology in creating a series of supernatural intelligent clones instead of rubbish dummies, who would actually become new government figures. However, because if everone is a clone, no one will be, Gorbachev himself has rejected that idea and, basing his suppositions of the lack of financial support for scientific research in the Party, has signed a mandate to discontinue the production of Politburo replacements at whole. This has led the Union into a bunch of lessingly important reforms which had cost the loss of basic governmental role and led to independence plenums (on the mandamus de facto level) from many annexed sort-ofs, including the Sort-of Belarus and the Sort-of Urkraine, whose people have finally suspected dummy replacements. The Brezhnev series were completely discontinued in 1987 and by 1988 all dummy prodction factories within USSR have closed their lines. His descendants include Leonidas Brezhnev, who has starred in the Russian version of 300 and is known for his famous line, "THIS IS MOTHERLAND!!!!!!!!" and kicking an American ambassador into a bottomless pit. This page was last edited on 30 August 2012, at 07:19.